2008: The Bishop of Norwich has announced the appointment of the first female archdeacon ever to be appointed to the Diocese of Norwich. The Revd Jan McFarlane, 43, currently Director of Communications and Bishop’s Chaplain in the Diocese, is to be the next Archdeacon of Norwich, while continuing her role as Diocesan Director of Communications. Jan will become the most senior female appointment ever in the Norwich Diocese and will succeed the Venerable Clifford Offer, who retires from full-time ministry at the beginning of August. Jan will become one of only 9 females among the 112 archdeacons in the Church of England. The Archdeaconry of Norwich covers Norwich and greater Norwich and comprises 42 parishes and 50 full and part-time clergy. Jan trained at Cranmer Hall, Durham and was ordained at Lichfield Cathedral in 1993. She served in the Stafford Team Ministry and at Ely Cathedral before moving to the Diocese of Norwich to take up the post of full time Communications Officer. The following year, her role was combined with that of Chaplain to the Bishop of Norwich, and she has held both posts for the past eight years. She is also one of the Diocesan representatives on the Church of England’s General Synod. Before ordination she worked as a Speech Therapist in the NHS in North Staffordshire. Jan will take up her new appointment early next year. An archdeacon is a senior member of the clergy responsible to the diocesan bishop for an archdeaconry. The archdeacon shares with the bishop the pastoral care of the clergy and undertakes much of the practical, legal and administrative work involved in the mission and ministry of a diocese. 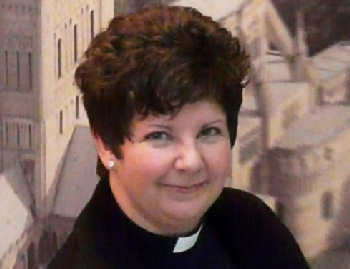 Pictured above is Rev Jan McFarlane. I congratulate Jan on her history making appointment. May God bless hr in her new post. The right choice and we've got someone with great sense of humour. There's hope for the C of E yet!! With prayers for the new role. just wanted to say I am pleased for you and wish you well in your new post. ( Mark Cranmer Hall 1991-95.) Bishop John Pritchard (JLP ) will be beaming from ear to ear. Thank you Jan for being a model of grace, wisdom and patience and a great pioneer.